Heathrow Airport (IATA: LHR) is in the west of London 17 miles (27km) from central London and is the world's busiest airport for international flights. 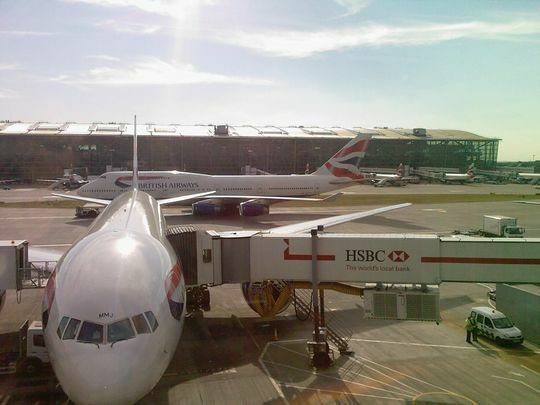 London Heathrow (LHR) is a giant, sprawling airport currently divided into four terminals (T2, T3, T4 and T5). The airport is so large it could almost qualify as being a small city in itself - indeed Heathrow is often described as an "aerotropolis" for this reason. Originally established in the late 1940s, it is London's primary airport, the premier air gateway into the United Kingdom, and is the busiest airport in the world for international passenger traffic and is Europe's foremost hub airport. Due to its size, increased security requirements and the fact that development had not kept pace with its growth, Heathrow became overcrowded and developed a reputation for long queues, inefficiency and delays. However, since Terminal 5 opened in March 2008, and despite initial problems with the brand new terminal, this situation has improved. Terminal 2, the airport's original terminal, closed in November 2009 for redevelopment - the new T2, also known as The Queen's Terminal, officially opened in June 2014. Terminal 1 closed in 2015 for demolition, and the site will be used for further expansion of the new Terminal 2. In 2016, the British Government approved a highly controversial plan to build a third runway to the north of the present airfield boundary, which will wipe out the entire village of Sipson, several adjacent housing estates and the existing "Heathrow Strip" of hotels. The proposals however, are not expected to be realised until the mid 2020s at the earliest. Check which terminal you need to use on the Heathrow Airport website  as the situation changes regularly! The airport is some 17 mi (27km) west of central London. A large part of the journey can be made by means of the M4 motorway, which can, however, be quite congested at peak periods. Terminal 5 can be reached directly from the M25. The airport is also near the M40 and M3. Bear in mind if you are intending to drive into the centre of London - you will be liable for the Congestion Charge - which is currently £8 per day and applies on weekdays between 7am-6pm. Automatic number plate recognition cameras are in operation, and your car rental company will track you down and bill you with the £30 fine if you fail to pay - you have been warned! There is also a massive difference in the prices charged by many car parks in and around Heathrow. For example, you can find individual house owners in the vicinity of Heathrow Airport who are happy to rent you a space outside their house for a week or two and it’s usually very cheap in comparison to the large car park operators; however, this is definitely a case of ‘buyer beware’! Another option is to choose the parking lots provided by hotels around the airports, there are some parking providers  that cooperate with them and only sell the parking spaces. so no booking for rooms is required. The good part here is that they are well connected by free public transport or the Hoppa busses to the airport and the parking fee is generally much cheaper than the official airport parking. All the terminals have very good public transport links to and from Central London, with options ranging from local and express busses to the London Underground and rail services. The majority of travelers heading to Central London use public transport. 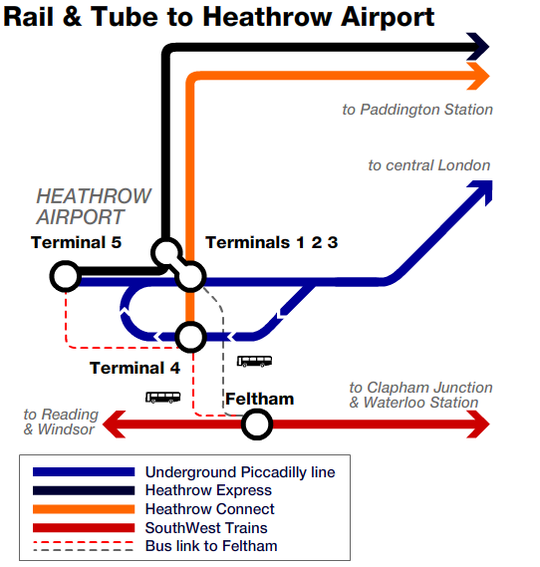 Note that there are different rail stations for the five terminals at Heathrow - be sure you take the right train as not all trains go to the same terminals. Direct from Terminals 2, 3 & 5, and via a connection from T4. Every 15 minutes. Oyster Cards not valid. The fastest way to Paddington and surrounding area from Terminals 1, 3 & 5 is the Heathrow Express  rail service, the journey to Paddington station takes around 12-15 minutes, but it is also by far the most expensive - in fact in 'per mile' terms, it has the dubious honour of being one of the most expensive train journeys in the world. The Heathrow Express does not operate directly to Terminal 4; you could take a connecting (Heathrow Connect) train to Terminals 1 & 3 and change - cross platform - to the Express, or walk (Terminals 1 to 4 are all connected to each other). Whilst it is by far the most pleasant and comfortable public transport option to and from the airport, the actual time saving of using the Heathrow Express for much of central London is often a false economy, given that Paddington is not close to much of central London. For many destinations you will have to transfer using the Underground or a taxi. Check your exact journey beforehand. Note also that the Heathrow Express places staff on many arrival gates and before passport controls selling tickets to arriving passengers before they have had a chance to weigh up any other public transport options. This could be viewed the first of many London tourist traps which can catch out the unwary. Unless you are intent on using the Heathrow Express anyway, ignore them and make your travel decision once you have cleared airside and you are less stressed. The train departs from Terminal 5 every 15 minutes, stops at Terminals 1 & 3 and then runs non-stop to London Paddington, Central London, where connections are available to the rest of London’s transport system. Journey time from Terminal 5 to London Paddington is 21 minutes, and from Terminals 1 & 3 it’s 15 minutes. The first train from Heathrow leaves at 05:42 (5:42 AM) and the last at 23:42 (11:42 PM). The trains are air-conditioned, modern, comfortable and are fully accessible with a wheelchair area, disabled toilet and level access to the station platforms. Free Wi-Fi Internet access is available on board. Mobile phone coverage is available throughout the entire route, including in the tunnels under Heathrow. On board TV entertainment plays throughout the journey, offering BBC News bulletins, destination information, comedy clips and trivia. Quiet zones are available where this does not play. There are two classes of accommodation - Express (Standard) Class and First Class. First Class offers a larger seat, more legroom (though there’s plenty in Express Class), tables and complimentary newspapers. The First Class area of the train also stops closer to the station exits. Fares can be purchased in advance on the Internet, from the station or on-board the train and they vary in price depending on where you bought them. An Express Class Adult Single bought online costs £16.50, or £18.00 at the station (£32 Return, online or at station), with a £3 surcharge over the at-station price if you buy on-board (per March 2010). National Railcard discounts are available at Heathrow Express station ticket offices only (with the exception of Disabled Persons Railcard, which can be used on-board). Child fares (5-15 years inclusive) are about half the adult fare. Under 5s travel free. If you book your ticket online you can have it sent to you as an email message to print out or as a mobile phone picture message, both contain a barcode and the conductor scans this on the train. London Travelcards and Oyster Cards are not valid on the Heathrow Express. Direct from Terminals 1, 3 & 4, and via a connection from T5. Every 30 minutes. Oyster cards not valid to/from Heathrow. This service uses the same route to London Paddington as the Heathrow Express but is a slower, less frequent train which also serves intermediate local stations in West London. It’s cheaper than the Heathrow Express and it serves Terminal 4 directly, but passengers needing to get to Terminal 5 have to change to a connecting service at Terminals 1 & 3. The Heathrow Connect  provides a convenient connection to London Underground’s Central Line at Ealing Broadway station. Somewhat sneakily, the Heathrow Connect is deliberately under-advertised in order to encourage travelers onto the considerably more expensive Heathrow Express. Trains depart Terminal 4 for London Paddington every 30 minutes (every 15 minutes to Terminals 1 & 3 only, for connection to the Heathrow Express), stop at Terminals 1 & 3, Hayes & Harlington, Southall, Hanwell, West Ealing and Ealing Broadway. Journey time from Terminal 4 to London Paddington is 33 minutes and 28 minutes from Terminals 1 & 3. The first train from Heathrow leaves at 05:23(5:23 AM) and the last at 00:01 (12:01 AM). The trains are air-conditioned, modern and accessible with a wheelchair area and disabled toilet. Although Heathrow and London Paddington stations have step free access, be aware that not all intermediate stations are wheelchair accessible. Audio and visual journey information is provided on-board. Mobile phone coverage is available throughout the route, including in the tunnels under Heathrow. Fares must be purchased before boarding the train (tickets will be checked on board and those found not to be holding a ticket will have to pay a penalty fare) and can be bought at station ticket offices. A Heathrow to London Paddington Adult Single costs £8.50 (£16.50 Open Return). Child fares (5-15 years inclusive) are about half the adult fare. Under 5s travel free. London Travelcards and Oyster Cards are not valid between Hayes & Harlington and Heathrow Airport. Passengers holding a Travelcard or Oyster Card must buy an additional ticket for the journey between Hayes & Harlington and Heathrow (£4.90 Adult Single). Bus link from Terminals 1, 2 & 3 (bus 285) and Terminals 4 & 5 (bus 490) to Feltham railway station. Trains every 20 minutes. Oyster cards are valid. Although a slower route, if you are heading for South London or West London suburbs, Richmond or Windsor, this could prove a useful shortcut. Regular bus services  run from the airport to Feltham station (single fare £1.50 on Oyster or contactless - no cash fares) and a frequent east-west rail line runs between Reading and London Waterloo (single fare £5). Depending on the route, some trains take 30 minutes (trains via Richmond), others take 45 minutes (trains via Hounslow and Kew), so it is advised to check the train times carefully if you are rushing to catch a plane. You must buy your train ticket before boarding as this is not an airport express train but a standard suburban rail service. You can use Oyster cards valid for zone 6 to use the train and bus on this route. London Underground’s Piccadilly Line Direct to Central London, up to every 5 minutes (dependent on terminal). Oyster cards are valid. The Piccadilly Line runs direct from all the terminals to the very centre of London, stopping at stations close to many of London’s landmarks, shopping and entertainment areas, as well as the major transport hub at King’s Cross St. Pancras. It stops frequently and is comparatively slow (60 minutes from Terminal 5 to King’s Cross St. Pancras vs 45 minutes using the Heathrow Express and changing to The Tube at Paddington). However, it is an integral part of Transport for London’s network so Travelcards and Oyster Cards are valid, making it a good value option. It’s also a fairly quick option if you want to get to much of West London. Trains depart Terminals 4 & 5 every 10 minutes and stop at Terminals 1 & 3 before continuing to London, thus making the frequency from Terminals 1 & 3 every 5 minutes. Trains to & from Terminal 5 do not stop at T4 and trains to & from T4 do not stop at T5. Be aware that if you are heading from Central London to Terminals 1 & 3 then it is normally quicker to wait for a train which terminates at T5 as the trains to T4 wait there for up to 7 minutes before continuing to Terminals 1 & 3. T5 trains go directly to Terminals 1 & 3 first, then continue to T5. The Tube closes during the night and first trains leave Heathrow at about 6AM, last trains are about midnight. Be aware that during peak rush hour periods the Tube becomes extremely overcrowded - particularly in the central zones. Trains originally designated for Heathrow are sometimes rerouted down the Rayners Lane branch or terminate short at Acton Town or Northfields to deal with peak-hour congestion - the driver will normally make an announcement if this is going to happen. Therefore if you are using the Tube to travel to Heathrow during rush hour - bear this in mind and leave Central London in plenty of time. If possible, avoid travelling during rush hour altogether. Also be aware that delay and disruptions frequently happen in the Tube, especially during the weekends when there are scheduled engineering works. It is a good idea to check beforehand of any travel disruptions (TfL website is the best source). In any case, even when there is no apparent travel disruption, it is always a good idea to leave plenty of time as the Tube is well known for being unreliable. As The Tube is a rapid transport system designed with short journeys in mind, the trains are not the most comfortable. However, from Heathrow there will almost always be seats available and luggage space is provided. There is space for wheelchairs and the Heathrow stations are accessible, but as The Tube is an old system originally built in the 19th century, very few stations in Central London are accessible to wheelchairs. Almost all involve negotiating stair cases and escalators. Earls Court is an exception and some other stations can be reached by wheelchair users by changing to alternate lines here. More stations are being adapted (King’s Cross St. Pancras is now accessible, for instance) and accessible stations are shown on the Tube Map available on TfL’s website . Audio and visual journey information is provided on board. The Tube is a closed system and nearly all stations have ticket barriers. Tickets should be bought at the station and the cost of a Zone 1 - 6 (Central London - Heathrow) single is £5.50. Penalty fares are in force for those caught without a valid ticket. Travelcards (day, or period tickets which allow unlimited travel on all of London’s public transport, not just The Tube) are available and will almost certainly provide better value if you plan on using London’s transport system more than a couple of times. The cheapest option for anyone spending much time in London will probably be to get an Oyster Card (a Transport for London travel smart-card), which is always cheaper than paying fares in cash. See the London article and Transport for London’s website  for more information on Oyster Cards and other available fares. Every 30 minutes direct to London Victoria Coach Station, National Express  run a direct coach service from Heathrow Central Bus Station to London Victoria Coach Station every 30 minutes. Some services are nonstop between Heathrow and Victoria, while others stop at Earls Court. Journey time is 40 to 50 minutes and fares are available from £4 if bought on the internet. Tickets can also be bought from the National Express ticket office at Heathrow Bus Station. Some services operate via Terminals 4 & 5, but the service is more limited. Free transfer is available to Terminals 1 & 3 and the Central Bus Station from Terminals 4 & 5 via the Heathrow Express and Connect trains or the shuttle bus services. Most coaches are accessible to wheelchairs. Services operate from approximately 07:00 (7 AM) to 23:30 (11:30 PM). London Travelcards and Oyster Cards are not valid. N9 Regular late night London Bus Service. During the night, when most of the rail and coach links (and the flights!) have stopped operating, one of the few ways you can get to & from Heathrow is by using the N9 night bus service, which operates to & from Aldwych in Central London via Hammersmith. The N9 is a normal Transport for London Night Bus service and so is subject to a flat fare of £1.50. Bear in mind you CANNOT pay cash on London's buses, you must buy an Oystercard or a Travelcard. These are valid on all London Buses services. Day time local buses to the areas surrounding Heathrow. In the day time there are no local bus services to Central London (that service is provided by The Tube), but there are plenty of services to areas of West London and outlying towns such as Slough and Maidenhead. Heathrow Airport publish a map  on their website showing the routes available. For the adventurous willing to make multiple bus changes to reach Heathrow, it is a good way of exploring the western suburbs of London. Fares vary depending on the operator, but Transport for London services (red buses) are subject to a flat fare of £1.50. Bear in mind you CANNOT pay cash on London's buses, you must buy an Oystercard or a Travelcard. These are valid on all London Buses services. If you are thinking of taking a taxi into London then consider the Heathrow Express (you can pick up a taxi at Paddington Station to complete your journey) or Dot2Dot instead. They will probably be faster and cheaper, and almost as easy to use. Heathrow does not yet have any direct rail services to anywhere outside of London, except Reading, meaning that you will have to go into the centre of the city and then come back out again, but making a connection in one of the central London railway stations is fairly easy. Heathrow is directly linked to London Paddington via Heathrow Express & Connect. All of the major railway stations are also on the Tube network, making cross-London connections from Paddington fairly straightforward. Below is a quick summary of the principal connections available. Paddington: For Oxford, Bath, Bristol, Penzance, Cardiff, Swansea and the overnight sleeper to Cornwall. Express coach links (branded RailAir) from Heathrow Central Bus Station operate to Reading, Watford Junction, Feltham and Woking stations to connect with train services. The Reading and Woking coaches serve Terminals 1 & 3 (via the Central Bus Station) & 5 directly, and the Watford Junction coach (Greenline service 724) serves all terminals. The Feltham RailAir link is actually provided by local bus services rather than express coaches. Service 485 takes you to Hatton Cross for Terminal 4 and then on to the Central Bus Station for Terminals 1 & 3. Service 490 goes to Hatton Cross, then onto Terminal 5. Through tickets are available to & from Heathrow Airport from any station in the UK, using either The Underground network, Heathrow Express or Connect from Central London or the RailAir coach links. If you want to use the Heathrow Express it’ll probably be cheaper to buy your ticket for it separately. Make sure you specify the method you want to use to reach Heathrow when you buy your rail ticket. For information, time and fares for trains to & from Heathrow Airport see the National Rail Enquires website . National Express operate direct coach services from Heathrow to many cities around the UK, as well as direct links to all of the other London airports. Most coaches serve Terminal 5 as well as the Central Bus Station, some stop at Terminal 4. See the National Express  website for information, times and pricing. Oxford Bus operate a 24 hour frequent (every 20 minutes during the day) coach shuttle service to & from Oxford called The Airline. Adult fares are £18 single, £23 period return. Further information can be found at the Oxford Bus website . Megabus Now operate direct services from the central coach station and also from Terminals 4 and 5 to Bristol, Cardiff and Gloucester. Connections are available at Bristol to various destinations in Devon and Somerset. Tickets MUST be booked in advance. There are many airport transfer services that provide personal transport services to Heathrow Airport. All transport companies that operate transfer services must be licensed with the relevant local authority. Drivers are issued a badge after undergoing various checks and vehicles are issued licenses confirming that they have passed rigorous safety checks and have the correct insurance in place. Drivers and vehicles are licensed as either Hackney Carriages or Private Hire, each one is covered by different regulations. When booking an airport transfer you should always check that the company has a license from the council. This is particularly important when booking over the internet or over the phone. Booking directly with a taxi company rather than with an online booking agency will usually be more cost-effective. For Pre Booked Journeys check with following Chauffer Services. As it's such a massive, sprawling place Heathrow has a significant internal transport system so people can get around. All travel within the airport boundary on local bus and Heathrow Express & Connect trains is free. Terminals 1 & 3, as well as the Central Bus Station are all in the 'Central Terminal Area' and are within walking distance, linked by underground tunnels with travelators. The Central Terminal Area is in the middle of the airport between the runways, Terminal 4 is in the south-eastern corner of the airport, beyond the southern runway and Terminal 5 is in the far west of the airport, between the runways. To get from the Central Terminal Area to Terminal 4 you can take the free Heathrow Connect train (every 15 minutes) or a bus. Similarly to get from the Central Terminal Area to Terminal 5 you can take the free Heathrow Express train (every 15 minutes) or a bus. To transfer between Terminal 4 & 5 there is either a direct bus service or you can take the train to the Central Terminal Area and change. Hatton Cross tube station is also a good spot for viewing the end of the runways, depending on what time of day when aircraft are landing or departing. There are restaurants and fast food outlets in the departure areas of all four terminals, though, like most airports, the food can be overpriced. Caviar House & Prunier Seafood Bar, 07:00 - 21:00 (7 AM to 9 PM), serves caviar, smoked salmon and seafood. Located after security in the international departure area. Boots, 06:00 - 22:00 (6 AM - 10 PM), sell a limited range of pre-packed sandwiches, salads and bottled drinks at a very good price. Located in departures, both before and after security, and in the arrivals hall. Marks & Spencer Simply Food, 06:00 - 22:00 (6 AM - 10 PM), sell a large range of pre-packed, sandwiches, salads, cakes pastries and bottled drinks. Not cheap, but good quality and value, after all - it's not just food! Located in the arrivals hall. Garfunkel's, 06:00 - 23:00 (6 AM - 11 PM), serves a range of British and American food including decent breakfasts. Located in departures, before security. Eat., 05:00 - 21:00 (5 AM - 9 PM), serve fresh, simple, seasonal sandwiches, soup, salad and cakes, bottled drinks and tea & fresh coffee to eat in or take away. Located after security. Caviar House & Prunier Seafood Bar, 07:00 - 21:00 (7 AM - 9 PM), serves caviar, smoked salmon and seafood. Located after security. Boots, 06:00 - 22:00 (6 AM - 10 PM), sell a limited range of pre-packed sandwiches, salads and bottled drinks at a very good price. Located in departures, both before and after security. AMT Coffee, 07:00 - 22:00 (7 AM - 10 PM). A coffee shop which also serves a range of snacks. Located both before and after security. Wetherspoons, 06:00 until last flight, serves a wide range of hot and cold pub food at a fair price (for London) as well as a large selection of beers and other alcoholic drinks. A traditional cooked English breakfast costs around £6 and will keep you going for most of the day. Family friendly. Located before security. Caffe Nero, 24 hours, serves fresh coffee, tea, hot drinks and italian style sandwiches and pastries. Located before security. Garfunkel's, 06:30 until last flight, serves a range of British and American food including decent breakfasts. Located after security. Est Bar Deli, 06:30 until last flight. Coffee, cocktails, wines and beer good quality freshly made sandwiches and salads. A good substitute for the lack of an Eat. in T4, and it sells alcohol too. Located after security. Caviar House & Prunier Seafood Bar, 08:00 - 20:00 (8 AM - 8 PM), serves caviar, smoked salmon and seafood. Located after security. Wetherspoons, 05:30 until last departure, serves a wide range of hot and cold pub food at a fair price (for London) as well as a large selection of beers and other alcoholic drinks. A traditional cooked English breakfast costs around £6 and will keep you going for most of the day. Family friendly. Located after security in T5 and T5B. Gordon Ramsay Plane Food, 05:30 until last flight. An airport restaurant from the 3 michelin star celebrity chef based on the Boxwood Cafe. Breakfast menu is available until 11:00. Serves a range of fine food tailored toward to needs of airport customers, example dishes include "Foie gras and chicken liver parfait, celeriac remoulade, toasted country bread" as a starter, "Escalope of veal, lemon, capers and a nut brown butter" main and "Valhrona chocolate fondue with banana, marshmallows and waffle" desert. Casual dress code. Not cheap. Located on the south side of the terminal after security. Remember London Heathrow Airport (LHR) is a massive airport with literaly hundreds of hotels within a 20 mile vicinity of the airport. Given the comprehensive transport links into the centre of the city, the airport's hotels can in fact be a cheaper alternative to staying in Central London (with its punitive hotel rates) if you are on a budget. Most of Heathrow's hotels are located on Bath Road, (jokingly known as the "Heathrow Strip" by locals), which runs parallel to the Northern Perimeter Road. As the name implies they are immedately north of the airport boundary, and offer probably the best views of the north runway (9R/27L) for those of a planespotting disposition! If you dont like all the chaos of the Perimeter Road/Bath Road busstle, try Longford Village, a paradise in the middle of the chaos of LHR. Tudor village with two pubs and one hotel, the heathrow lodge (heathrowlodge.com). free transfers to the airport and located on the perimeter Road its 5 minutes away from T5. Yotel, Heathrow Airport, Arrivals Mezzanine Landside, Terminal 4, . Booking by the hour for a minimum of 4 hr. edit Note, getting from the new Terminal 5 to the Yotel in terminal 4 is awkward at best, as you need to be escorted out of the the secure area. These escorts are available only hourly. Novotel London Heathrow Hotel, Cherry Lane West Drayton junction 4m4 , ☎(+44)20 7660 0681, http://www.novotel.com/gb/hotel-1551-novotel-london-heathrow-airport/index.shtml Novotel London Heathrow Hotel is located 1.5 km from London Heathrow Airport. This airport hotel is within easy access of the main terminals, whether using public or private transportation. From £49. ibis London Heathrow Airport, 112 Bath Road, ☎(+44)208/7594888, http://www.accorhotels.com/gb/hotel-0794-ibis-london-heathrow-airport/index.shtml Ibis Hotel Heathrow Airport is 1 km from Heathrow Terminals 1, 2, 3 & 4. Hotel Hoppa Buses H6 (T1, 2 ,3) and H56 (T4, 5) run every 20 min from 05.30 to 23:00; £4 each way. FREE local bus service from central bus station runs 05.30 to 23:30 (105, 111 to Harlington Corner). The entire airport is covered by free Wi-Fi which is available for 45 min free for everyone and 90min free for members of Heathrow Rewards Loyalty Card (free to join). Although the speeds and connectivity are stable and more than good enough for general usage, when paid for, the speed increases by around 5 times. Every airline or alliance lounge has free Wi-Fi. While this can 'leak' out to the areas around the lounges, they often require a password which changes regularly.